Ricoh's CX4 is a powerful compact digicam created with your creativity in mind. It's great quality, performance and ease-of-use leave you wanting to have it all the time. Read more in our Full Conclusion. 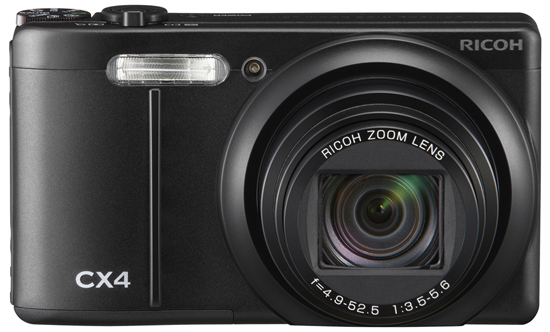 Ricoh's CX4 is a compact featuring their Pure Image Quality Technology. A combination of the lens, image sensor and imaging engine combine to capture what the human eye sees. They have also included a slue of advanced AF modes and burst shooting options that allow you to not only capture numerous shots quickly, but also add creative modes that combine multiple shots inside the camera. On top of these excellent features, the camera also sports a 10-Megapixel CMOS sensor, 10.7x optical zoom lens, sensor shift image stabilization, scene auto mode, 720pHD video capture and a high resolution LCD that you normally only see on dSLRs. This camera is very easy to use, allowing anyone to pick it up in S-Auto mode and shoot. At the same time, it has enough creative features and abilities to keep anyone satisfied. The Ricoh CX4 is available now with a MSRP of US $399.99.